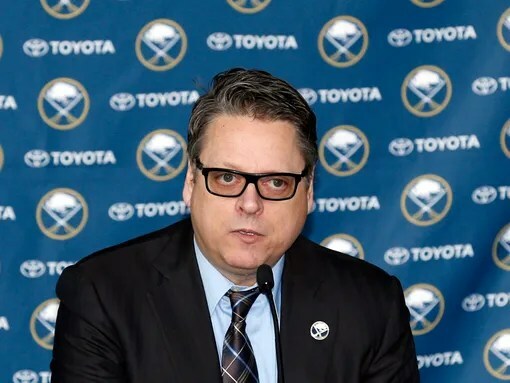 Tim Murray dropped a bombshell at the GM meetings when he told Pierre LeBrun that he wants another first round selection in the upcoming draft and that he’s willing to take on salary in order to accomplish that goal. In addition to the second overall pick, Murray will be selecting 31st, 39th (from Winnipeg via Minnesota) and 49th (from Minnesota) this season (along with the 61st overall selection). Murray also holds three first round picks in the 2015 draft plus his own second round selection and that of the Islanders. He has nine picks in the top 60 of each of the next two drafts that he can offer in a trade, although I’d be surprised to see any of the first round picks moved until after it’s determined if any won’t be part of next year’s lottery. Murray’s assets don’t end with draft picks either as players like Chris Stewart, Drew Stafford, Christian Ehrhoff and possibly even Tyler Myers could also be dangled in trade offers. His quote at today’s GM meetings hits home less with regard to the interest in getting back into the first round but given that he’s willing to take on salary from another team in order to bring in another first round pick. It’s going to take some very savvy negotiations for Murray to snag a first round pick without sacrificing a number of assets as any other team would when trying to move up in the draft. It seems safe to assume that any trade would include at least two of Buffalo’s three second round selections along with one of their more attractive trade chips from the active roster. It also seems safe to assume that Murray isn’t going to be interested in anything lower than the 20th overall selection if he’s giving up anything tangible to move back into the first round. One final consideration to keep in mind is that the Sabres, while able to take on a boatload of salary, won’t want to take on too long of a contract as they’ll be stuck with a heavier cap hit once their rebuild hits full steam. The only contracts that would begin to get the Sabres in trouble would be anything over five years whereas deals under that threshold wouldn’t hamper the team down the line. After perusing the league’s larger cap hits, I came up with a relatively short list of players who could potentially serve as a valuable cap dump for their respective teams. The Sabres would still need to sweeten the pot enough to balance the scales for their counterpart, but there are probably a few realistic scenarios where Murray could potentially come away with some additional cap and a bonus first round pick. Not every team had a player who stood out and I skipped over some others that people will point out (see: Richards, Brad). What I’ll have below is a general list with a names you could lobby for in this scenario based on their cap hit, term and status with their respective club. Montreal: Daniel Briere – $4m cap hit through 14-15, NMC/NTC: Briere saw his minutes cut as the season progressed but added to his playoff resume with another respectable run. The Canadiens could certainly use a little extra wiggle room to fit PK Subban’s next contract in and potentially swapping Briere out for a more effective forward could certainly be attractive to them. I could see this materializing and benefitting both sides. Montreal is picking relatively low in the first round, but it would give Murray another pick. Columbus: RJ Umberger – $4.5m cap hit through16-17, modified NTC: While I’m not sure what Umberger’s NTC stipulates (the same goes for Briere), the mutual agreement for Umberger to move this offseason might just make him an ideal target for Murray. He’s signed for three more years, offers a veteran presence to a young locker room (he wears a letter for the Jackets) and has a formidable cap hit. What would it take to get Umberger and Columbus’ first? Probably a fairly large offer. Minnesota: Kyle Brodziak – $2.83m cap hit through 14-15: The Wild are expected to sign Thomas Vanek and could potentially sniff around some other big names depending on what Vanek signs for. Offering to save nearly $3 million off their cap could be a bargaining chip for Murray. Winnipeg: Evander Kane – $5.25m cap hit through 17-18: Kane isn’t going to be moved in the type of situation Murray alluded to. But that doesn’t mean I can’t see Murray chasing him in a hockey trade. Tampa Bay: Ryan Malone – $4.5m cap hit through 14-15, NTC (12-team no trade list): Off-ice issue not withstanding, I’m not sure he’d be willing to waive his NTC to come to Buffalo. The Lightning have first round picks to spare and it’s been rumored they’ve been looking to move him for some time now. His recent arrest makes me think he’s going to be an untouchable, but he definitely fits the same description as Brodziak and Umberger in terms of what Murray spoke to. Phoenix: Martin Erat – $4.5m cap hit through 14-15: The Capitals practically had to give Erat away last year and his recent play certainly puts him in “salary dump” territory. I could see him fitting just like Malone, Brodziak or Umberger. He has one year left on his deal and hasn’t offered much offensively in quite some time. Washington: Mike Green – $6.083m cap hit through 14-15, modified NTC // Brooks Laich – $4.5m cap hit thru 16-17, NTC (5-team no trade list): Buffalo’s blueline depth might make acquiring Green an odd choice, but his play hasn’t justified his salary recently. I’m sure the Caps would love to get out from under the last year of his contract and I could see the Sabres having the capability of offering the Caps adequate return (more than likely Chris Stewart). Laich fits the description of a player a team could be looking to dump, but I don’t see the Capitals being so desperate to move his salary that they would toss in their second round pick. Philadelphia: Braydon Couburn – $4.5m cap hit through 15-16, modified NTC: This is more dependent on what the Flyers choose to do this offseason than anything else. They’re sniffing around the cap ceiling and dumping Couburn’s salary could certainly help them. I have doubts that they’re game to including a first round pick, however. There were a handful of other players I considered in this practice but chose to leave out of the post. Names like Jeff Skinner, Alex Burrows, Patrick Marleau and others who are on clubs who already expressed their plans to rebuild – thus making their first round pick harder to obtain – or are simply picking too high in the draft to consider giving up their first pick. I feel that the players and teams who would best fit Murray’s criteria would be Minnesota (Brodziak), Columbus (Umberger) and Washington (Green). All three teams sit outside the top-10 and could each use varying levels of cap relief. The Wild are the only team of the three who wouldn’t benefit from taking on another player (in terms of cap space) while the other two have enough wiggle room to not only rid their books of an ugly deal but also bring in a new asset for the coming season. This doesn’t make the deal any easier to pull off. In fact, it remains an incredible tricky venture to even fathom. I’d be shocked if Murray is able to find a dance partner for this particular venture. However, I’d be even more surprised if he leaves Philadelphia having not made any moves. Previous Article How Are The Bills Shaping Up?